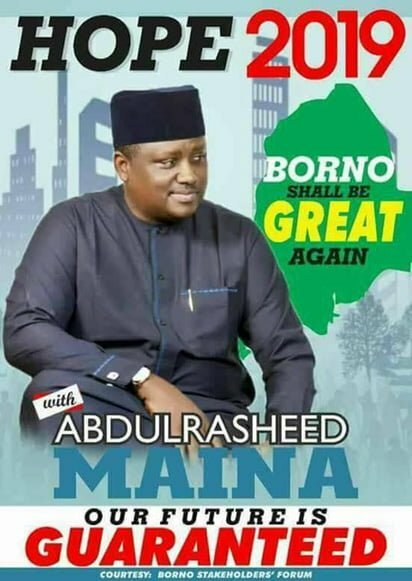 Governorship campaign posters of embattled former boss of Presidential Task Force for Pension Reforms, Maina Abdulrasheed, have emerged in major cities across the Northern part of the country ahead of the 2019 general elections.. The posters are reportedly sighted on the streets of the Federal Capital Territory, FCT, Borno, Kaduna and Bauchi States respectively. The posters have the imprint of Borno Stakeholders’ Forum as sponsors, bears the caption: Hope 2019 and a promise. Other inscriptions include: “Borno Shall be great Again and with Abdulrasheed Maina, Our Future is Guaranteed”. Maina is currently on the run for allegedly committing N2.1 billion while in office and was fired from the service by President Buhari on Monday, October 23rd. However, reports had it that the Attorney-General of the Federation and Justice Minister, Abubakar Malami had directed the Federal Civil Service Commission (FCSC) to reinstate Maina, after being on the run for alleged N2b scam, among others. Displeased by the report, President Buhari had on Monday ordered the immediate disengagement of Maina. Next articleWenger urges fans to keep supporting the club amidst tough times. NBA Roundup – Lakers survive early scare from Rockets.